The U.S. Senate approved Oklahoma Attorney General Scott Pruitt today as head of the Environmental Protection Agency, throwing the future of the agency into doubt. The heavily contested decision puts one of the fiercest legal challengers of federal environmental rules at the helm of the government arm that oversees them. Pruitt filed 14 lawsuits against the EPA while serving as attorney general. All but one of these cases were filed in collaboration with fossil fuel industry players, which he will now be in charge of regulating. Conservative groups praised Pruitt's confirmation, with the Competitive Enterprise Institute’s Myron Ebell calling him "a great choice" to lead the agency. "He has been charged with fulfilling President Trump’s campaign promises to undo Obama’s massive over-regulation of resource and manufacturing industries," said Ebell, in a statement. “We are confident that Scott Pruitt is up to the challenge." The Senate approved Pruitt’s nomination Friday afternoon in a 52-46 vote, with two Democrats from coal-rich states, Joe Manchin III of West Virginia and Heidi Heitkamp of North Dakota, voting in favor, and one Republican, Susan Collins of Maine, voting against him. In an overnight standoff, several Democrats attempted to delay the vote until next Tuesday, when the Oklahoma attorney general’s office is scheduled to release around 3,000 of Pruitt’s emails related to his interactions with the fossil fuel industry -- but the effort failed. The emails could reveal potentially disqualifying information on Pruitt, which the ranking Democrat on the Environment and Public Works Committee, Thomas Carper, said would be “wise” to review. But Senate Majority Leader Mitch McConnell refused the request. In a rare display of defiance, many current and former EPA employees spoke out against Pruitt in the lead up to today’s vote, urging their Senators to reject him. According to Reuters, EPA staff have been warned that President Trump plans to sign a handful of executive orders intended to “reshape the agency,” as soon as Pruitt is confirmed. Following the vote, David Cox Sr., national president of the American Federation of Government Employees, which represents more than 9,000 employees at the EPA, pointed out that the agency is smaller today than in 1999, despite an expanded list of responsibilities. “Starving this vital agency of the resources it needs to carry out its important work threatens the health and safety of all Americans,” he said. Pruitt’s confirmation effectively puts a nail in the coffin of the Obama Clean Power Plan (CPP) -- which many Republicans have railed against and Pruitt is currently suing to dismantle. Former EPA chief Gina McCarthy has said that scrapping EPA climate regulations won’t be easy. But when it comes to the CPP, legal experts say the Trump administration could at the very least delay implementation until the rule effectively dies. What the effect will be on the renewables sector is unclear. 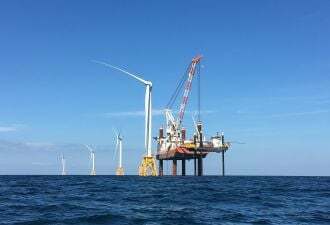 Some industry insiders believe throwing out the CPP could put a chill on renewable energy investments, while others say scrapping the rule would do little to slow the industry’s momentum. U.S. investor-owned utilities, some of which supported the CPP, said they will continue to advocate for a “clean and affordable energy future” under Pruitt’s tenure, in a statement issued by the Edison Electric Institute President Tom Kuhn. Environmental groups issued swift and strong reactions against Pruitt on Friday. “Regardless of political view, background or income level, Americans want the government to protect our air, water and climate,” said Andrew Steer, president and CEO of the World Resources Institute, pointing to recent polling. “If Scott Pruitt rolls back these vital protections, the backlash will be fierce. Meanwhile, Americans’ health and economy would suffer." 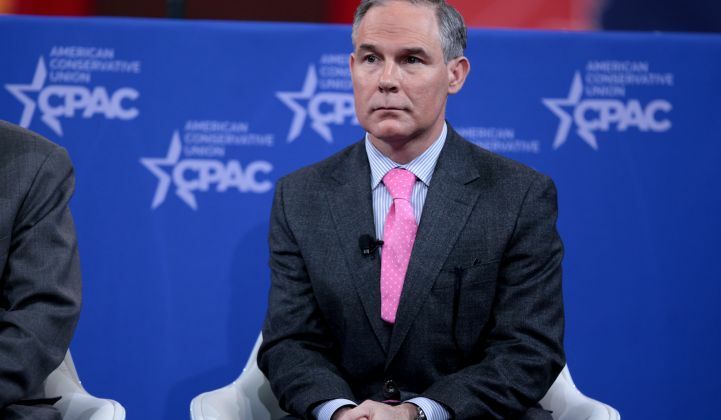 Steer called for Pruitt to protect the EPA’s commitment to “open and transparent scientific data, which is essential for sound policymaking and maintaining trust with all Americans,” he said. Rhea Suh, president of the Natural Resources Defense Council, echoed that message. “We’ll use every tool in the kit to stop him from harming our air and water, endangering our communities and surrendering our kids to climate catastrophe,” she said. This article has been updated to reflect that Pruitt sued the EPA 14 times as Oklahoma attorney general. The previous version said he had sued the agency 13 times.